LIVES LIKE A BIG 3-BEDROOM! TWO FULL BATHS plus two half baths. BEST VALUE for the size, quality, location. More than twice the size of a cramped 2-bedroom condo, with two master-size bedrooms upstairs and great privacy for a third major 'bedroom' in the large basement family room, because it's separate from the main floor living room and has a 1/2 bath. High-quality queen sleeper couch with memory foam pad . Reagan National Airport is 10 minutes almost unaffected by traffic, Dulles IAP 40 in light traffic, and BWI IAP about 45 minutes in light traffic. I highly recommend you use Google Maps “time of arrival” feature to get their estimate based on your arrival time. Uber and drive/park work great according to all our clients! MetroRail differs little in cost and time because daily fares are about $5 per person each day and you have to walk to the station, wait for a train and possibly line changes. We are NOT WALKING DISTANCE TO METRORAIL, but Uber is $10-18 each way depending on where downtown you're headed, and it's normally about a 20 MINUTE DRIVE AND PARK IN DC at 9:30 AM, AS YOU CAN SEE FROM OUR CLIENTS' REVIEWS. The Smithsonians open at 10, so you're ready for fun! . FAR LARGER (1800 sq. ft.) than a condo, plus you have a big elevated deck in the backyard to enjoy fresh air in the shade of trees, and a Weber barbecue for your grilling pleasure. 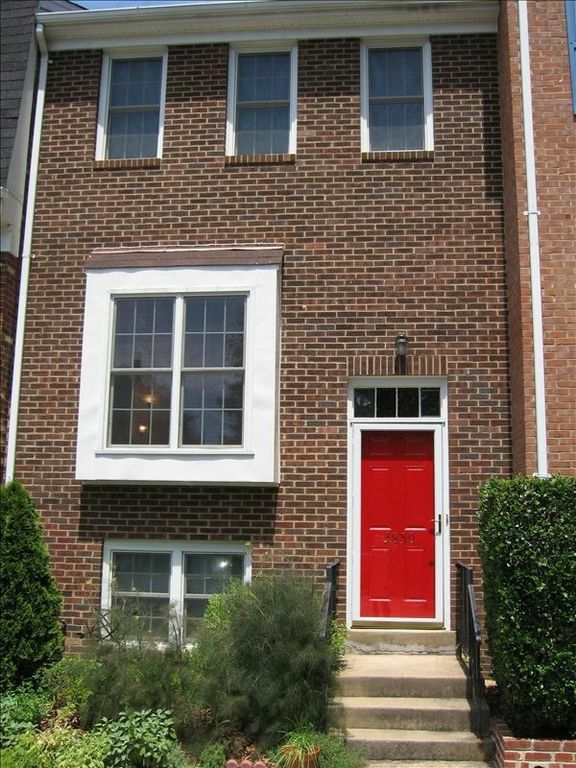 BEST VRBO VALUE IN THE DC AREA that sleeps 6 and has two full baths (plus two half baths). Far lower cost than two tiny, boring rooms at the nearby Best Western Pentagon motel. PLEASE CHECK OUR AVAILABILITY CALENDAR - always up-to-date. SEND AN EMAIL TO GET MANY MORE DETAILS AND SOME GREAT TOURING TIPS! VERY UNLIKELY TO ALLOW A MID-WEEK ARRIVAL AND/OR DEPARTURE March through August, unless it's within a month of arrival. Over our 11 years we've found that our clients overwhelmingly prefer weekend arrivals and/or departures and we end up nearly fully booked each year during high season. Therefore, we would lose a week of income. Sorry, just a pragmatic decision. COMPLETELY RENOVATED top to bottom. Much nicer than when we bought it brand-new in 1980. Kitchen and all baths gutted and replaced with premium materials. Granite countertops kitchen and all baths, all new deluxe appliances, custom cherry cabinets, refinished hardwood floors, custom shower and bathtub, stainless plumbing fixtures, lush carpeting, composite deck, superb heat pump, etc., etc., VERY NICE. Lovely and well-equipped, 2 miles due-south of the Pentagon, at the northern edge of Alexandria. EQUIPPED AS A TRUE HOME because we visit for two months every year. NOT "JUST" A VACATION HOME. We love to entertain, so the kitchen is particularly well equipped, with a full range of spices, oils, pans, utensils, small appliances. Our location is very convenient to the District. Outside of rush hours it's routinely about 10 minutes to the Lincoln Memorial. You can certainly use Metrorail if you wish, by taking the convenient bus from right outside our little community entrance to/from the Pentagon Metrorail station in 16 minutes during rush hours, or drive/uber/cab in less than 10 minutes to two Metrorail stops. Uber for 4 people from here to the Smithsonian Air and Space Museum is $10-14. Quiet, friendly, safe little 37 unit community. Many of the residents have been in our home for parties. Two families who are close friends live on either side of our place. The master bedroom has a king bed and ensuite bath with shower. The other bedroom is master-size, because we took out a wall between two small bedrooms. It has a queen bed, and the full bath with tub/shower is 7 feet from the bedroom door. The basement has a spacious family room with fireplace. This can also be a comfortable fairly private bedroom away from the main floor. It has a high-quality queen sleeper couch with memory foam pad and a 1/2 bath. Yet another 1/2 bath on the main floor, with a beautiful high-ceiling living room and dining area with a table that can seat 10. FREE OFF-STREET PARKING, with a marked, permanently reserved spot at the front door plus a parking pass to use an unreserved space. All linens included, hair dryers in the two main baths, clothes detergent and softener, iron with board, dishwasher detergent, vacuums. You only need shampoo and shower soap. We stay a month every spring and fall, so it's impeccably-maintained and our terrific housekeeper Juana keeps it VERY (think Hilton hotels) clean. Dozens of excellent restaurants of nearly every type within 1-2 miles, with a book containing recommendations for the best. Giant Food supermarket less than a mile, Harris Teeter 1 1/2 miles, Whole Foods 2 miles, Trader Joes 3 miles. Major shopping at the Pentagon City Mall just 2.5 mi. Detailed maps in the “clients' basket” in the living room. Cable TV, broadband and WI-FI. Large-screen HDTV in the basement den. Small library selection and CD music selection. If you like to bike, we're about 1/2 mile from the Four Mile Run Trail, which is a 7-mile, paved bike trail in Arlington County, Virginia that runs along Four Mile Run from Falls Church to the Mount Vernon Trail near Ronald Reagan Washington National that goes along the Potomac for 17 miles. Payment: Personal check, Homeaway Payments, Paypal, bank transfers. If you have special needs, talk with us. Life is full of solutions. We live in Hawaii on Oahu above Pearl Harbor (2 or 3 hours earlier than Los Angeles), so please keep the time zones in mind. Email is best and I monitor it regularly, but I'd love to chat with you, keeping in mind the time difference. For the fun of it, because we live in Hawaii we've decorated in 'Hawaiiana', which is quite different from the button-down 'Georgetown drawing room' style that's the area norm. You'll feel a little as if you're visiting us in Hawaii! Check out our video for a better feel. Aloha from Michael and Virginia! It's not JUST a vacation rental. It's one of our two homes. Our emotional connection to it, our incredible friends in the area, and our nation's capital make it far more than a 'vacation rental property'. New high-end heat pump. Complete comfort. All the bath/hand towels, and washcloths. CD player which is Itunes-capable and will also take memory sticks. Instructions in the "touring basket" in the living room. Enough dishes and tableware for a few days between washing. Table seats up to 10, with tablecloths for all sizes and napkins. CD player and a selection of CDs. The player is Itunes-capable and will also take memory sticks. Instructions in the "touring basket" in the living room. Some CDs next to CD player, with several Hawaiian selections. Very nice elevated deck with table and chairs, shade most of the day. If you are on the run all day every day you won't see all the major sites in our wonderful Capital region. This is a great home in a great location. Perfect to relax and enjoy family after a fun day of activities in D.C! We enjoyed our stay here very much. The owner was very informative and the location was great. It was a very quick trip into DC. We highly recommend!! Love the opportunity to help our clients. A good time in our wonderful Capital Region, with a comfortable home base is our goal. Awesome property in an excellent location! I took my family of 5 for a week to DC. This property was great! It was fully equipped with towels, linens, dishes and everything else that we needed. It also had all the little things whose availability makes a huge difference. For example, there is a fully outfitted spice rack in the kitchen. It seems like a little thing, but a dash of garlic powder and oregano can make all the difference when cooking. I'd also include things like dishwasher soap and laundry detergent in this list. It's clearly a well cared for property that doesn't feel like a typical rental. As for location, we really enjoyed being a bit outside of DC proper. Transportation in was simple. We used Uber to get back and forth and averaged around $20-$25 each way for the five of us. Michael was easy to work with and offered lots of good suggestions for how to navigate the city and what to see. If you're thinking of making the trip to DC, I would recommend this property without reservation. I will be recommending it to any friends and family that are thinking of heading this way. Just what we love to hear. We want our home to be our clients' home. Comfortable, with everything you'd expect for a great visit to our incredible Capital Region. Ken and I spent two weeks over Christmas in Michael and Virginia townhouse. Unlike most of you, we were not in town to sight see, but to be with our family for the holidays. This townhouse is perfect. It is clean and well appointed. The kitchen is well equipped to for any kind of cooking. . The table seats 10 people when it is opened up, allowing us to host Christmas Eve dinner. Our son John from Montana stayed with us for six nights, making good use of the extra bedroom and bathroom. Our son Dave's family stayed over the night of the ND game so that we could all commiserate together. We only hope that Michael and Virginia allow us to stay again next year. We get a lot of satisfaction from our consistently good reviews, but this one means a little more because of their family story. We greatly enjoy making some personal contact with our clients and this was a perfect example. Thanks Michael and Virginia for sharing your wonderful home away from home, for our family to enjoy. The location was great and served perfectly for what we wanted to to do. Our 7 yr old granddaughter fell in love with your tree swing and will give us lasting memories for bonding between Papa and Beanie. If we have the opportunity, we would certainly rent your home again, and would definitely recommend it to others. We're lucky to have a nice home in a convenient location. Our little 36 unit neighborhood is lovely. Our clients are great! Thoroughly enjoy helping a little with accommodations and touring advice. Great fun to know they're having fun and are comfortable. We arrived the week of Thanksgiving to find an extremely clean, well equipped, organized and spacious home. The kitchen was especially well equipped with everything we needed to prepare any kind of meal and there were plenty of dishes, silverware, cups and glasses of all kinds. The owners thought of everything to make this townhouse as comfortable as possible and gave us some great tips on getting around in D.C.! The location was great for driving to and from D.C. within 20 minutes and parking was easy with only bit of searching and use of parking apps (parking whiz, parking panda etc...). There is so much to do in the D.C. area that we could not do it all in 4 days. We loved the National Museum of the American Indian , the Smithsonian museums, touring the Capitol and the Library of Congress is well worth stepping into even if only for a few minutes . I highly recommend visiting the National Bonsai museum at the U.S. National arboretum (it is a few minutes northeast of the main D.C. tourist area but you can spend the day here, bring a picnic lunch and enjoy the beautiful grounds). The Sunday, Monday, Tuesday, and especially Wednesday before Thanksgiving proved to be good days to visit D.C. with reasonable traffic and smaller than normal crowds. We hope to return soon to do all the things we missed and plan to rent this comfortable home again. It was perfect for our family of 5. I'm happy that our home was a comfortable base of operations, but I'm ECSTATIC that these wonderful people made the most of our incredible Capital Region. Come one, come all, stay with us or not, but PLEASE spend some significant time here. I promise you'll make wonderful lifetime memories. Aloha and God Bless America. CANCELLATION POLICY: Full refund 60 days before. After that, up to full refund depending on whether we can rent most of the dates. We rent about 200 days a year and have only a handful of open days each month during high season.